A weird, depressing film that mixes genres and styles and plot developments so fast and so often that it creates an almost entirely new type of visual storytelling that I imagine had rarely ever been seen on-screen before, or since. The film is a hodgepodge of grit and poverty and misery and desperation, occasionally broken up by some really catchy and cheerful song and dance numbers. And Björk only makes matters stranger, with her weird, sort of beautiful yet sort of alien like face and that high-pitched, heavily accented voice of hers. The accent is strong even when she sings, if not more so, and it makes for quite the crazy concoction of sounds and images. Just bizarre, but in a good way, sort of. The story is typical Lars von Trier; the first third or so is sort of light and fairy tale like, with elements of community and friendship and general acceptance among the characters of who they are and what their place in the world is. General goodness, in other words. But then there’s a dark revelation, the ticking clock, and then the first dark turn comes, and man is it dark, wow. Some of it feels forced for sure, especially the last third given how **SPOILERS** obviously kind and sweet Björk’s character is. I mean, the death penalty, really? For a blind person who can barely even walk straight, let alone find an officer’s gun and shoot him with it? Why didn’t she speak up for herself, or defend herself at all for that matter? Why didn’t any of her friends say anything to the court about her gradual blindness, or, I don’t know, helped find a doctor to examine her eyes to prove she wasn’t pretending to be blind? And rather than taking the $2000 she needed for a good lawyer from the doctor who she paid to perform the surgery on her son, couldn’t her friends have raised that money some other way, or hired a cheaper yet still competent lawyer, or done something more useful than sit idly by looking sad? Obviously she’s not going to agree to use the money she intended to save her son with on herself. Come on. Common sense. **END SPOILERS** It just felt like the story was conspiring too much against her, to an unrealistic degree. It’s effective, don’t get me wrong, but man. Too harsh. Give the woman a break. And the song and dance sequences are so bizarre. Catchy and well choreographed, but everything is shot in such a simplistic handheld style that it almost feels like you’re watching someone’s home video rather than a professional musical number. I liked it, though. Never seen anything like it, at least, and it works in its own strange, cheap looking way, though I can see why some people wouldn’t much care for it. The last scene/song especially, when she’s **SPOILERS** about to hang **END SPOILERS** was great. So brilliant and sad, and the way it just ends. Great stuff. And yet the songs aren’t even all that well sung, even from Björk who has a strong voice, but sometimes sounds almost subhuman. It’s really, really odd, all of it. Ultimately, I can’t quite wrap my head around this film. I enjoyed it, sure, and it’s certainly very effective, but portions of it felt sloppy, maybe intentionally so, who knows? 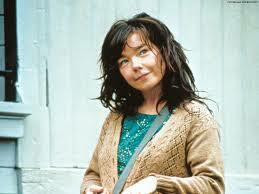 The acting is pretty good from just about everyone, though Björk is better in some scenes than in others. She’s not terrible, though. In fact, if I hadn’t known she wasn’t an actor, I wouldn’t have even noticed. It’s a compliment, believe me. So yeah, pretty good, unique, depressing film that is sort of a genre unto itself. The depressing tragedy musical, or something. Very unique, at the very least. Worth watching, if it’s your kind of thing.